So Excited. That's been me since I discovered one of my most favorite thriller authors back when I read 'Final Girls', with its flashy red and black cover, back in the first week of July of 2017. 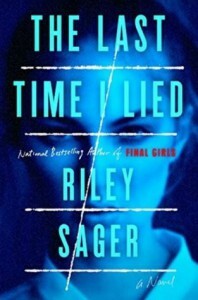 I now like to pretend that author Riley Sager is releasing his books in time for my birthday each year, even though this time I was one of the lucky ones to get to read the book early. This time I had to save my review for this tour, and deliberately chose this date (Friday the 13th), since it's the end of the tour, and so I could play around with some horror movie and books in my post. How could I not, when the plot of the book is set at summer camp in the woods, just like one of the most iconic horror movies of all time?! And I'll unashamedly say right now that after finishing this book, the first two words out of my mouth (and originally onto social media, along with 5 stars), were 'Holy ***p, so you can probably tell I love the book. So with no surprise I can tell you now that the book is already on the New York Times Bestseller list, and has been optioned by Amazon Video to be made into a miniseries (at time of writing). I’m thrilled for Mr. Riley Sager! My post for you below will be a review PLUS a ‘quick chat’ about some of the best horror/thriller novels that have been made into movie adaptations, thanks to the above news. I hope you can dive into the book recommendations! AND GOOD LUCK with the GIVEAWAY!! Now a full-time author, Riley's first thriller, FINAL GIRLS, became a national and interna-tional bestseller and was called "the first great thriller of 2017" by Stephen King. Translation rights have been sold in more than two dozen countries and a film version is being developed by Universal Pictures. 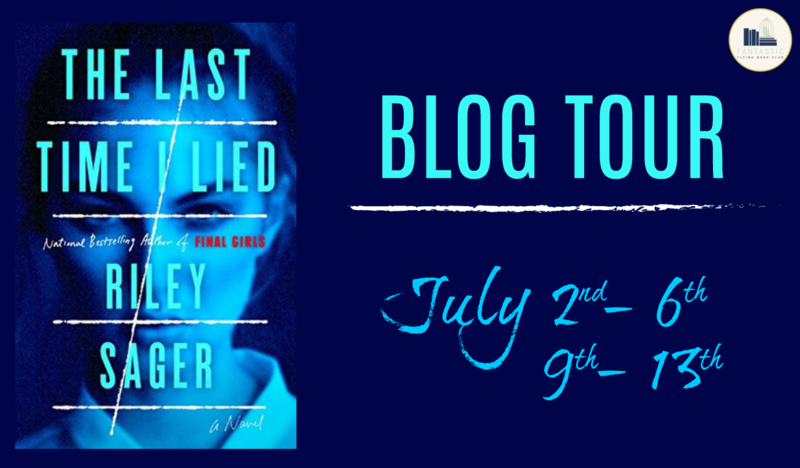 Riley's second book, THE LAST TIME I LIED, was published July 3rd. It was inspired by the classic novel and film "Picnic at Hanging Rock" and one horrible week Riley spent at summer camp when he was ten. A native of Pennsylvania, Riley now lives in Princeton, New Jersey. When he's not working on his next novel, he enjoys reading, cooking and going to the movies as much as possible. His favorite film is "Rear Window." Or maybe "Jaws." But probably, if he's being honest, "Mary Poppins." Two Truths and a Lie. The girls played it all the time in their tiny cabin at Camp Nightingale. Vivian, Natalie, Allison, and first-time camper Emma Davis, the young-est of the group. The games ended when Emma sleepily watched the others sneak out of the cabin in the dead of night. The last she--or anyone--saw of them was Vivian closing the cabin door behind her, hushing Emma with a finger pressed to her lips. So by now, you have had the chance to read the synopsis of the book, and even better, may have already read the book. Usually for my blog tour posts, I do straight reviews, and immediately my response for the book, upon finishing it, I was blown away, and couldnt even write my review as soon as I had finished. I was speechless, and I then uttered a few curse words because Sager has written yet another bloody brilliant book. In FINAL GIRLS, Sager blew us out of the water with a thriller that focused mainly on two girls , and the very concept that they were the final girls left from slasher killings (even without the book revolving around the killings themselves) was enough to get into the reader‘s psyches and make us all terrified. In THE LAST TIME I LIED, he manages yet again to take the reader to a very vulnerable place, alongside the main character Emma, this time back to when she was a teenager, self-conscious and needing to be accepted, but how could it be worse than back then? Going back to the same camp as an adult where your friends went missing and you were accused of being responsible for it, that’s how. But Emma is going to figure out what really happened at Camp Nightingale all those years ago (Jason Voorhes had nothing to do with it). The book is absolute brilliance, in terms of pacing, use of different timelines (and we see this as a writing device a lot, but not always done well), depth of characters, and ultimately, the story has the best plot twist I could (never) imagine. One of my best (sorry, Sir Sager) compliments is that I could swear Riley is a female author because he writes female voices so well. I don’t know how he does it. So I never went to summer camp - this is something kids in America do, I learned this from watching movies and reading teen novels (I grew up up in Hong Kong and England; I’m a Brit, if you don't know this yet), so this American custom fascinated me when I was younger. I definitely didn't play two truths and a lie. Somewhat ironically though, my parents did send me away to boarding school all the way back in England while we lived in Hong Kong (actually at my request). And so I wanted to talk about movies AND books (I just so happen to have a film degree and once upon a time, used to work in film production). As I mentioned, I also just happened to have heard the insanely awesome news that THE LAST TIME I LIED has been acquired by Amazon Video to be made into a series, and I couldn't be more excited. ~ A little bit before going away to Battle Abbey back in the UK, I went to a sleepover and I saw a movie (adapted from a book) that changed me to no end (and made me want to bail and go home). I also just saw that Riley is a big fan of this one too, PICNIC AT HANGING ROCK by Joan Lindsay. About girls at a Victorian boarding school in rural Australia, several girls go missing to never be found ever again when a group goes on a picnic one day out at this huge rock formation. It terrified me. This is a must see and read. ~ Several books on this list will not be a surprise, perhaps because the films are so notorious (as is the author), but that's the thing - go and read the book and you will find out why they were able to make such a successful film: the book was good. You may have seen CARRIE by Stephen King, but have you read it? It's pretty short, just 305 pages (my copy), but the 'Carrie' you read may end up giving you a whole different perspective. First of all, did you know this was Stephen King's first novel?! Such immense talent from the get-go. And another author who was able to connect with his feminine side agnd create a female character that will NEVER be forgotten! ~ Another King book to read that was then filmed (by one of the best directors of all time, Stanley Kubrick), THE SHINING. To get lost in the depths of this book, is to get lost in the recesses of Jack Torrance's mind. The film has been dissected and mimicked, and has now become part of popular culture, but the novel came out a good 3 years before the film; why not read it and see what you make of it today? It reads differently from the film, but you can see why Kubrick (plus the excellent cast, and everyone from production design to location scouts) made couldn’t have gone wrong with this one. ~ One of my all-time favorites is next: this novel was actually more popular than the film, selling over 4 million copies, making it the best selling novel of the 1960’s, where the success would help launch the "horror boom", where horror fiction would achieve enormous commercial success. Do you know what it is? ROSEMARY’S BABY by Ira Levin. This was Ira's second novel and he knocked it out of the ballpark with a story about a couple who move into a Gothic Revival style New York City apartment building, and end up finding out they are living next to leaders of a Satanic coven. I won't go further than there. I will then say that Roman Polanski's film, made just a year later, in 1968, starring Mia Farrow, is utter movie perfection. Ironically (or not), my son's name is Roman. ~ Last classic to read that has been adapted that basically needs no explanation or introduction, is PSYCHO by Robert Bloch (I choose this over THE EXORCIST, also by Bloch; as much as I love that film, this is a quieter book and film, and the methods by which the directors got their performances were very different, ie. Hitchcock vs. Friedkin). It’s a much shorter book, and I think most readers will find a this a more satisfying read. Maybe play the soundtrack in the background while reading. That might be more infamous than the books or film for some people. And since it's Friday the 13th, you should guess what I’ll suggest you should watch, even though it’s one of the cheesiest horror flicks out there...that’s right, switch over to Hulu tonight and watch the ‘campy’ horror flick from 1980 that started off a whole slew of horror movies in the same vein, the one and only original, starring Kevin Bacon himself, FRIDAY THE 13TH. It actually makes me laugh even though it still makes me jump (number 2 is better, when Jason starts doing the killings - sorry if I spoiled anything). But it will get you in the mood for Camp Nightingale and Riley’s excellent thriller in the woods. I don’t know what Riley Sager will come up with next time but I’m super appreciative the books release in time for my birthday, and even more so, that we have one of the best thriller writers of our generation right here, right now. Even Stephen King said so, not just me. * This time there's no Rafflecopter or anything like that; there's 1 finished copy per blog— that's right, you can WIN A COPY OF THE BOOK RIGHT HERE! Thank you to Dutton Books. * Note: winners may only be chosen ONCE for the tour, meaning each person can only win from one blog and if they win on another blog they are to turn it down or be disqualified completely (you can enter on another blog but only win once). I love feedback and I can’t wait to read your answers (I’ll be drawing a winner on the 20th)! Let me know what your favorite book is too, if you like.